Melanie Mynhardt, a 4th Year marketing student at Institute of Technology Carlow, was recently awarded a six-week internship with international animal feeds exporter Connolly’s RED MILLS, following a collaboration between the company and the Institute’s Faculty of Business and Humanities. Speaking to the group, Michael Connolly said: “The presentations today represented some of the highest standards we’ve seen from college students on this kind of initiative. 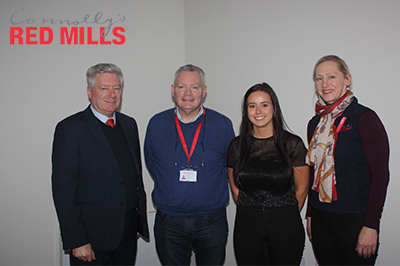 As a global company and one of the largest employers in the area, Connolly’s RED MILLS is delighted to be collaborating with the marketing students and staff at IT Carlow and look forward to many such opportunities in the future”. To conclude the day, Rita Kelly had this to say: “We would like to thank Connolly’s RED MILLS for having us here today, it is fantastic for the students to experience this kind of collaborative opportunity with industry”.